The German national team manager Joachim Loew has said that he is extremely happy with the defensive performance of the team in the 0-0 draw with Netherlands. Germany were coming into the match on the back of 4-4 draw with Sweden, which has increased the criticism of the manager. Germany were cruising comfortably for a physical in the match before they allow Sweden to score four goals in the 30 minutes. As a result of this poor defensive performance, the manager decided to bring in changes to the first team. He also had to make changes as a result of injuries and suspensions to a number of first-team players. He played without a striker in this match, which increased the defensive performance of the team, but blunted their attack. However, Joachim Loew has said that he is pleased with the outcome of the match. He has praised the discipline and the work done by the defence in order to keep a clean sheet following the Sweden match. Loew also has expressed his surprise at the way Netherlands played, as the opposition were also extremely cautious in order to not concede goals. Netherlands were coming on the back of a poor Euro 2012 showing and the new manager Louis van Gaal has already made substantial changes. “We had this opportunity to play a strong team and it was a very meaningful game, and it was positive. We showed good discipline and good defensive work, which after our recent games, especially Sweden, was most important. I was a bit surprised by the way they played – maybe they were a bit scared of us countering them so they sat deep and you don’t usually expect that from Holland,” said Loew after the match. Germany’s next match will be in a friendly against France in February. The under pressure Germany manager Joachim Loew has said that he is hoping that the German national team finally end the disappointing year on a high when they take on Netherlands. Germany have endured a disappointing 2012 after they lost out on the semifinals of the Euro 2012, while they were recently guilty of squandering a four goal advantage in the group match against Sweden. As a result, it has increased the pressure on the manager Joachim Loew, who was once hailed as the untouchable. Germany, however, have been successful against Netherlands in recent seasons. They will be looking for the third win against the Dutch, who come into this match in decent form. More than the Euro 2012 loss, Joachim Loew has been severely haunted by the match against Sweden. After seemingly getting an unassailable 4-0 advantage of the match, Germany managed to surrender the lead and draw the match 4-4. Due to the fact that Germany will also be without a number of high profile players like Bastian Schweinsteiger and Miroslav Klose for this match, it is expected to be extremely even this time around. Joachim Loew has called for the players to produce a good performance and end the season on a high. “We want to finish the year on a good note, and win over our fans with a good performance,” said the Germany manager ahead of this match. “Germany is definitely under pressure after the 4-4 against Sweden. They are desperate to restore some pride,” said the Dutch national team star player Arjen Robben. Following this match, Germany will be playing against France in the friendly match. The 4-4 draw with Sweden has thrown this group wide open as of now, but Germany are expected to qualify comfortably when the World Cup qualifying campaign concludes next season. The German national team manager Joachim Loew has said that he is confident that the team will not suffer any hangovers from the Euro 2012. Germany will be starting the World Cup qualifying campaign with a view of continuing their impressive run in major tournaments in recent years. They will be playing against Faroe Islands and Austria in the first two matches of the World Cup qualification. Even though they seem extremely easy matches on paper, the German national team manager reckons that it would be anything otherwise. As a result, he has called for the best performance from his players. He has also removed any doubts lingering within the German fans that the team is still suffering from the hangover of the Euro 2012. Despite being one of the favourite teams to win the tournament, Germany suffered a shock defeat in the semi-final of the competition to Italy. Since then, there has been a lot of criticism for the manager Joachim Loew, who has failed to get Germany a major trophy despite being close on numerous occasions since the 2006 FIFA World Cup. 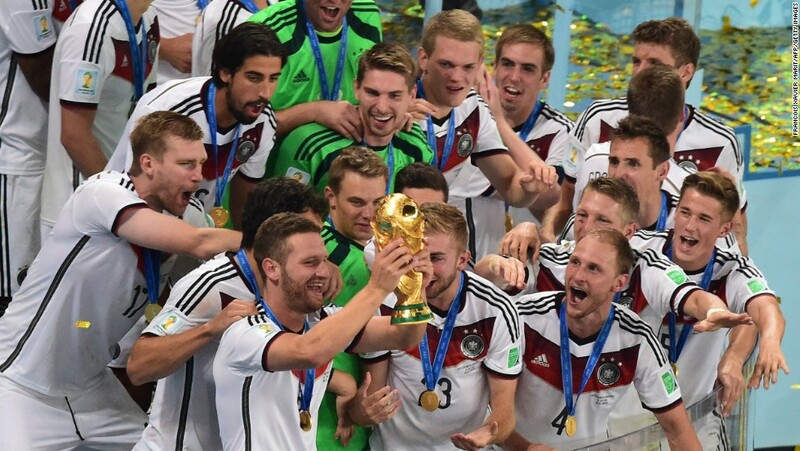 Germany are once again the favourites to lift the 2014 FIFA World Cup in Brazil. “The players have put their disappointments behind them and there is real hunger for success. That goes for the coaching staff as well. We completed the last qualifies in a rousing manner. This time it will be more difficult, the group is very even. There won’t be any pushovers. We have to improve when we don’t have the ball. I place value on the way we develop going forward, but we must be more active off the ball and make sure we don’t give our opponents any time,” said Joachim Loew ahead of the match with Faroe Islands on September 6. The Bayern Munich sporting director Matthias Sammer has said that one of the main problems with the German national team at the moment is that it does not have a true identity. The German national team has been modified a lot in the recent seasons, with the addition of many young players like Sami Khedira and Ozil. As a result of the high quality youngsters included in the squad due to the changes in the youth policy of the nation, they have been able to reach finals and semifinals of major competitions without any trouble. However, winning the matches has been a major problem for the German national team in the final stages. Germany last won a major trophy back in 1996. Even though they may have come extremely close on many occasions in the last five years, Matthias Sammer reckons that it will not happen before the German national team identifies itself with its true identity. The current national team manager Joachim Loew has made the national team extremely exciting to watch with beautiful passing football. However, Matthias Sammer reckons that it does not reflect the true identity of German football and the national team will be able to take advantage of its quality only if they find it. “Do Germany actually have a footballing identity at the moment? Apart from saying we’ve got some good lads coming through? I don’t see one. Right now, I can’t really define our football. You can define Spain, Italy and some other nations, but I’m having problems with Germany. What do we stand for? At the moment it’s for good young players, but overall, we could restart work on our footballing identity, because we should always look reality straight in the eye,” said the Bayern Munich sporting director in a recent interview. Germany national team manager Joachim Loew has said that he is extremely happy with the squad strength within the German national team, while he has also said that the time was good in order to ring the changes against Greece. Despite playing Greece in the quarter-final stage of the competition, Joachim Loew decided to use a number of fringe players that demonstrated his confidence in the squad strength. A number of the first-team players like Thomas Müller and Mario Gomez were rested in place of veteran striker Miroslav Klose and Marco Reus. Germany were even stronger against a poor Greece side, which has led to intense praise for the squad strength of the Germans. Germany are undoubtedly one of the favourites to win the Euro 2012 along with the likes of Spain and Italy. However, they have been truly spectacular in the tournament up until now, as they have become the only team to have won every single match. They defeated Greece 4-2 in a highly thrilling encounter, but the match was extremely one-sided. The scoreline was flattering towards Greece due to the fact that they had very little efforts on goal, but managed to score two goals. Germany, on the other hand, were fantastic. “I had a feeling after three wins that we had to make some changes to breathe some life into the team. The time was ripe to do something different. I think they did it well. That was a class performance from the team to reach the semi-finals for the fourth tournament in a row. We can be proud of the team. Greece is a curious team. They had one chance and scored two goals. But we didn’t get nervous after 1-1, and the goals came,” Loew said after the match. Germany are likely to face Italy or England in the semifinals. The German national team manager Joachim Loew has said that he expects the Bayern Munich players to bounce back from the disappointment of having lost the Champions League final at the hands of Chelsea on Saturday. It has been a very disappointing season for most of the players at Bayern Munich after they have finished second in everything. Not only have they finished as runners-up to Borussia Dortmund in the league, but also in the DFB Cup as well. They were hoping to avoid the same fate as Bayern Leverkusen in 2002 by at least winning the Champions League on May 19. However, despite dominating the entire match against Chelsea, they could not convert chances into goals. Thomas Müller scored the only goal of the game for Bayern Munich with only a few minutes remaining in normal time, but they allowed themselves to go into extra time after Didier Drogba’s equaliser in the 88th minute. Finally, they lost the match on penalties after having allowed themselves to go into penalties. Arjen Robben missed the crucial penalty in the extra time, which would have handed the club their first title in two seasons. Despite the second loss in the Champions League final in two years, Joachim Loew believes that the Germans in the team will come strongly at the Euro 2012. “I know the players. It will take a few days but they will pick themselves up. They reached the final and were the better team. There’s no reason for them to doubting their own qualities. They can be proud of playing great games in the Champions League. They did almost everything right in the final, and only luck was missing. A pity for Munich, for Germany and all football fans. Their confidence won’t be affected. They have done wonderfully well and were in the race everywhere until the end,” said Joachim Loew.